Back in 2015 I posted on this forum asking for help to identify an Excelsior motorcycle that I had acquired. The frame number is C1/326. At the time I mistakenly came to the conclusion that this ‘C1’ prefix referrred directly to a model variant and through eliminating various posibilities I concluded I had a model C1 Condex built in 1956. I now see that this isn’t the case as I’ve obtained a Shell Servicing Data Sheet for a C1 Condex that gives detailed spefication for the bike, including the fact that both D12 and C1 Condex models had girder front forks. My bike has telescopic front forks. Within the Excelsior model range there were both C1 Courier and C1 Condex models, and possibly more. So, i reason, may be it’s a C1 Courier. However, pictures I can find online confirm that this isn’t the case either. Early C1 Courier models are superficially similar (telescopic front forks, plunger rear suspension, traditional single sprung saddle etc) but also have the small triangular tool/storage boxes either side of the rear wheel. My bike has the cylindrical toolbox beneath the saddle mounted on the vertical tube behind the engine. Later C1 Courier models had telescopic swingarm rear suspension. Well, as luck would have it I found a picture of what I believe isn’t an identical bike to mine on Sheldon’s Emu. I’ve been in touch with the owner of the bike and will hopefully be able to confirm fairly soon that it has a similar frame number, not that this will necessarily lead to identifying what this bike is. But I have posted a picture of the bike, plus some detailed shots of my bike, just in the hope that someone may be able to help me. So one of the pictures is a nearly complete bike, currently residing in Africa and still running apparently, that I believe to be identical to mine. It’s missing the cylindrical toolbox and headlamp, but in every other respect, including the colour, I believe it’s the same. The other pictures are of components of my bike, the top triple clamp and the frame that pertain to specific details that I hope help identify the exact model I have. If it helps here are some obvious clues...the upper triple clamp has the type of fitting for two separate handlebars (as on a Talisman) rather than the more conventional four bolt clamps. The frame tube below the tank and vertical tube behind the engine are two separate tubes joined by a cast lug with fittings for the tank and seat (as on a Talisman) rather than the single bent tube as seen on say, the Roadmaster. The forks are of a similar type to those on a later model Consort, I.e. With short tapered section at top of fork, rather than the longer taper as on the Roadmaster or Talisman. Any thoughts or help would be immensely appreciated. My son and I, who in the process of restoring the bike, are just beginning to run out of options for ever finding out what it is. For a plunger framed bike, I'd expect that 1956 is a bit late for those features. I don't suppose you have measured the bore size (and stroke ? ), that would at least give us the engine size. I'd guess 175cc, for no particular reason than they were popular, and it looks larger than 125cc. 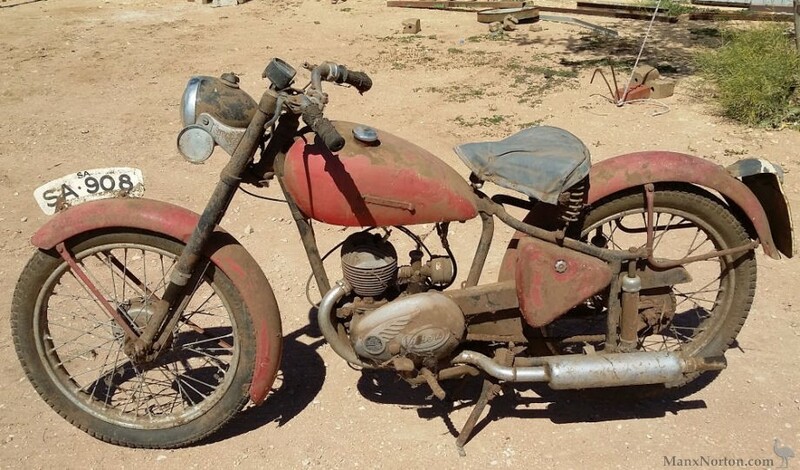 This is a 1950ish model, although a Universal 125cc, it has most of the same features. There was a 175cc version, I'll have a look shortly. Excelsior sold squillions of these* (*probably a slight exaggeration). Hmmm I can't make this pic display. Its the red Universal immediately above your bike on Sheldons. btw, you do know your cylinder head looks to be fitted backwards. On re-reading your post, I'm not entirely sure what is yours and what isn't. So some or all of my above may not apply. Is a pic of your complete bike available to view, anywhere. 1. The top triple clamp on my bike does not take a single bar with the regular four bolt clamps, but instead takes two separate short bars that slot into two holes in the triple clamp casting, similar to some models of Talisman. They are held there with a pinch bolt for each bar. 2. The frame design is slightly different at the meeting of the vertical tube and the tube that runs under the tank. The red Universal has a single tube bent into shape, whereas my bike has two tubes brazed into a cast lug where the two tubes meet. 3. The toolbox on my bike is the cylindrical typenthat sits behind the engine, not the two saddle type tool kits that sit either side at the rear of the frame. I believe the engine should be a 175cc, as you suggest, but what I actually have is a 197cc from an Ambassador. The only picture of anything like a complete bike that matches mine is the green bike in my post above. This is the only picture I have ever found that matches my bike, despite many hour spent searching. Physically at least it matches my bike perfectly. I’m waiting on some additional pictures from the owner to confirm various details, including the frame number. When I posted back in 2015 it was suggested that I visit to VMCC library to see what they have. I think this could be my next step. I may also contact DVLA, but I’m pretty sure their records don’t go back that far I suspect. I believe the bike was found in Ireland, so I may try and contact their equivalent of DVLA as well.